Book depository of the Russian State Library. Source: Aleksei Kudenko/RIA Novosti. John Smith’s colonial history, the Empress’s ‘Old Rose and Silver’ and other American treasures reside at the Russian State Library, formerly the Lenin Library. 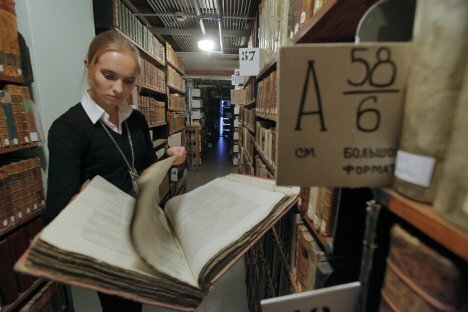 After winding through wooden corridors and marble staircases, visitors to the Russian State Library arrive at the Book Museum – or as it’s also known, the rare books collection. Among ancient Cyrillic manuscripts, they encounter a more surprising find: John Smith’s “Generall Historie of Virginia, New-England and the Summer Isles,” published in 1632. How the book got to Moscow is a mystery. “Through the process of acquisition, information is often lost,” said Elena Stepanova, head of the library’s rare books division, as she opened its white pigskin cover. Source: Ekaterina Shibaeva, Press Photo. The Russian State Library stands across from the Kremlin, its dark columns heralded by a slouching Dostoevsky statue. Founded in St. Petersburg as The Rumyantsev Museum, it moved to Moscow in 1862. Later the Bolsheviks named the library after Vladimir Lenin and proclaimed it the national Lenin Library in 1922. Still known affectionately as the “Leninka,” it retains its image as a Soviet temple of knowledge. But this communist library has a capitalist treasure trove: The Russian State Library amassed a collection of rare American books during the Cold War, when the U.S. and Russian governments poured funding into acquiring books from the other side. On a recent morning, there were no visitors to the Book Museum display on the history of bookmaking. The real action was unfolding on a metal cart, where Stepanova had assembled a sampling of rare English-language books from the stacks. John Smith first published his New World chronicle of “all those Countryes, their Commodites, people, Government, Customes and Religion yet knowne” in 1624. The Russian State Library’s copy was printed “by I.D. and I.H. for Edward Blackmore” in London, only a year after the author’s death in 1631. Stepanova estimates it could be one of around 1,500 or so printed, though the library is unsure how many other copies survive. The title page, printed with copper plates, bears an exuberant map of the new colony of Virginia, complete with sailing ships, dashing explorers and a portrait of Queen Elizabeth. Of the library’s 300,000 rare and valuable items, she estimates that 2,000 are American. “We have very few [early] American books, because when Americans started printing it was practically the 18th century already,” she said. The collection’s holdings expand considerably beginning in the mid-1800s, when Yankee publishing boomed. One of the most eye-catching volumes is Thomas Lorain McKenney’s “History of the Indian Tribes of North America,” printed in Philadelphia in 1855. Among its hand-painted lithographs is “Mo-Hon-Go, an Osage woman,” who is depicted in a red European-style blouse paired with indigenous jewelry. 2,000 American works are in the rare books collection of the Russian State Library. These books can be seen upon request in the Book Museum. 300,000 storage units are in the Collection of Rare and Valuable Books. It contains books from the 15th century to the present. While the library is creating digital versions of its pre-20th century books – an electronic database that currently numbers 100,000 items – the American rare book collection has so far not been included in the initiative. These books can only be seen upon request in the Book Museum. The library doesn’t keep records on what collector or library donated a book, so unless a title is inscribed with its owner’s name, its history is often lost. Complicating matters further, some books’ provenance was intended to remain secret. During the Stalinist Terror, owning English-language books was a dangerous liability. In hopes of preserving their libraries, some collectors gave them to eminent bibliophiles like Anatoly Tarasenkov, who then donated them to the library. “Sometimes people even removed gift inscriptions,” Stepanova said. “Because if the inscription was from an enemy of the people and you had the book, well...” Before giving a book away, owners removed any identifying bookplates. Today, some books still bear a discolored spot where an ex libris had been affixed. Fortunately, some books are less shrouded in mystery. A 1929 edition of “Candide,” published in New York with illustrations by Rockwell Kent, bears the signature of film director Sergei Eisenstein. The Russian State Library located in Moscow is the largest in the country and the third largest in the world for its collection of books. The library has over 170 miles of shelves with more than 43 million items, including over 17 million books and serial volumes representing 367 languages; the foreign section represents about 29 percent of the entire collection. The library was founded in 1862 as Moscow’s first free public library, then called The Rumyantsev. It housed the art collection of Count Nikolai Rumyantsev, which had been given to the Russian people and transfered from St. Petersburg to Moscow. The donation also included books and manuscripts as well as an extensive numismatic collection. Many books have the imprimatur of the Romanov libraries, which were nationalized after the 1917 revolution. Chicago Tribune magnate Robert McCormick presented a signed copy of his book “With the Russian Army” to Nicholas II, whom he had interviewed as a war correspondent. In July 1914, Empress Alexandra Feodorovna carefully signed her name in her own dark blue, silver-embossed copy of Myrtle Reed’s “Old Rose and Silver.” Reed’s quiet narrative of a girl, her widowed aunt and their garden was printed in New York in 1911. Today, the Russian State Library maintains partnership with the Library of Congress and other American collections. “Our specialists are in very frequent contact,” said Ekaterina Nikonorova, the Russian State Library’s director of special projects. Earlier this year, Nikonorova traveled to New York to represent the library at the annual New York Book Fair.